Imagine 2.25 tons of chickpea harvested in just 75 minutes! The process (including cutting and threshing) would normally take three days. This is made possible due to the breeding of a taller chickpea variety that can be harvested by standard machinery. The chickpea variety, NBeG 47, is the first machine harvestable variety released in Andhra Pradesh suitable for the state’s variable climate. This development was demonstrated recently in a farmer’s field in Andhra Pradesh’s Anantapur district showing how farmers can save time and money. The chickpea variety planted in farmer B Rameswar Reddy’s field was developed by Dr Veera Jayalakshmi, Principal Scientist (Chickpea Breeding) at Regional Agricultural Research Station, Nandyal. The breeding material for developing this variety and technical support was provided by ICRISAT. “Currently chickpea farming in Andhra Pradesh is partially mechanized – the crop is cut manually and then fed into a threshing machine. 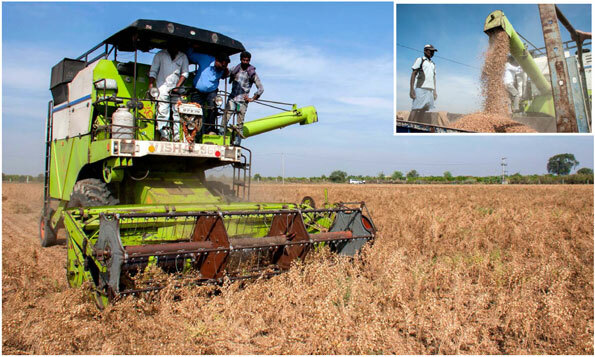 The total mechanization of harvesting is cost effective and quicker, reducing the risk of the ripened crop’s exposure to untimely rain or other extreme weather conditions,” says Dr Pooran M Gaur, Principal Scientist, Chickpea Breeding, ICRISAT. Dr Jayalakshmi says the farmer will keep a portion of seeds for his next crop and make available this new variety to other interested farmers in the region. She adds that machine harvesting is better for the health of the laborers, especially women, as handling the crop causes painful dermatitis due to its high acid content. This innovative variety was developed to address the issue of labor shortage on farms and reduce drudgery, especially for women laborers. The yield of this new variety, 2.25 tons per ha, is on par and in some conditions better than the existing ruling variety JG 11 (1.75 to 2.5 tons per ha), provided the prescribed plant spacing is followed. Other traits such as disease and drought tolerance are also on par with the JG 11 variety. Dr Jayalakshmi says the variety was derived from a cross between an ICRISAT line ICCV 2 and a local line PDG 84-16 and grows to a height of 60 cm under prevalent conditions in southern India. Like paddy or wheat, it is amenable to mechanical harvesting. Dr Y Padmalatha, Associate Director of Research, Regional Agricultural Research Station, Nandyal, says that while scientists come up with innovations for better farming practices, policy makers need to provide much needed support to price pulses like chickpea so farmers get consistent market value for their crops. The demonstration of the variety was recently held at Vennapusapalli village of Andhra Pradesh, where local community leaders and farmers from other villages learned about the new variety. Research efforts are underway to develop machine harvestable chickpea varieties suited for other parts of India like Uttar Pradesh, Punjab, Madhya Pradesh and Karnataka. Investor: Department of Agriculture and Cooperation, National Food Security Mission, Ministry of Agriculture, Government of India. Pearl millet germplasm accessions selected on the basis of grain yield, country of origin, cropping cycle, resistance to downy mildew, head type and grain color were of great interest to partners at a recent field visit to the ICRISAT-Niger. “What we have seen in the field was impressive in terms of the performance and diversity of pearl millet germplasm accessions. Also, with our visit to the genebank we learnt a lot on seed processing and conservation for better use,” said Ms Nasser Aichatou, Director, AINOMA Seed Company. ”The performance of pearl millet germplasm accessions demonstrated here could contribute to boosting productivity and the Niger government should link this opportunity offered by ICRISAT with the Nigériens Nourrissent les Nigériens (3N) initiative to reach the goal of food security,” said Mr Ousmane Abdou, Representative of the Ministry of Agriculture. The materials showcased during the field visit are the result of a pre-breeding trial including 241 germplasm accessions from the ICRISAT-Niger genebank, representing accessions from West and Central African (WCA) countries and 4 checks (2 hybrids and 2 Open Pollinated Varieties (OPVs)) planted during October 2015. Recently developed high yielding and high-iron OPVs (ICTP 8203 & SOSAT-C88) and hybrids (ICMH IS 14002 and ICMH IS 14012) were used as checks to compare the performance of genebank accessions for yield and its related component traits. The objective of the experiment was to evaluate the phenotypic performance of these germplasm accessions for further utilization in pearl millet breeding programs across by WCA partners and worldwide. During the visit, participants were introduced to accessions that included Gueriniari-1, Okashama-1 and Moro, all known for high iron content. These genotypes (basically the Iniari type) have contributed to development of high-iron accessions such as ICTP 8203 and GB 8735. The phenotypic performance of recently introduced biofortified (high-iron) pearl millet variety ICTP 8203 and new single-cross hybrids (ICMH IS 14002 and ICMH IS 14012 selected by Dr Prakash Gangashetty, Post-Doctoral Fellow - Pearl Millet Breeding, ICRISAT, were also great attractions. “These pre-breeding germplasm accessions will also be further used for grain sample analysis to assess their genotypic potential for biofortification,” said Dr Gangashetty. Another point of interest for the participants is the advantage of producing pearl millet seeds during the off-season to avoid cross-pollination and certain pests and diseases. 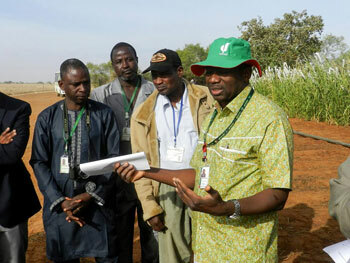 The field visit, held on 22 January, had representatives from Ministry of Agriculture, the National Seed Certification Agency, the National Agriculture Research Institute (INRAN), Institut de recherche pour le développement (IRD), Food and Agriculture Organization of the United Nations (FAO), private seed companies (AINOMA and MANOMA) and farmers’ organizations. Investors/CGIAR Research Programs: Genebanks, Agriculture for Nutrition and Health and Dryland Cereals. New partnerships are being forged with companies keen to achieve more impact and efficiencies by collaborating in their CSR programs. Eight companies, a representative from the Confederation of Indian Industry and ICRISAT met for the first time to identify areas of common interest in CSR and identify ways to collaborate to make the whole more than the sum of its parts. All participants were in agreement that they should collaborate for CSR activities as it will be a win-win situation. It was recognized that much greater impacts will be achieved by pooling resources in CSR; being able to create a larger multiplier effect and compress the time for success. Areas of common interest were identified. However, other CSR areas being invested in were also seen as complementary and important to achieving a more holistic approach to development. Although many companies are already working in partnership for their CSR, it was recognized that this was on a project level and something much larger with greater impact should be aimed for. (eg, sharing selected information) through to developing a mega initiative and leading to large-scale adoption. The idea to explore the possibilities for stronger collaboration in CSR was first suggested by SAB Miller and other companies who asked ICRISAT as an independent agency to act as catalyst to initiate and coordinate the idea. Some key conclusions highlighted by Dr David Bergvinson, Director General, ICRISAT, included that we all have common interests to see benefits in society and the environment. ICRISAT wants to see its world class research taken to scale and reach the intended beneficiary. We are all focused on sustainable and equitable solutions and collaborating in CSR can assist in improved return on investment as well as improved net present value. We need to do more faster because most of the issues need urgent attention. It was noted that there is a need for hard science as well as the soft skills to understand why people do or don’t adopt practices. There is a science to adoption and large scaling up which CSR can assist with and needs to address to be successful. there is a need to create an ecosystem where any efforts help each other as well. A consortium could map out the ecosystem to achieve this and diverse partnerships are a great value to bring about change. Other companies interested in joining the CSR Consortium are welcome to contact ICRISAT. The untimely demise of Dr Kanwar Lal Sahrawat on 3 February 2016 has shocked and deeply saddened colleagues and partners of ICRISAT. His contributions towards science and his positive attitude towards life, has lifted the spirits of many young scientists and staff of ICRISAT and national research programs in both India and Africa. 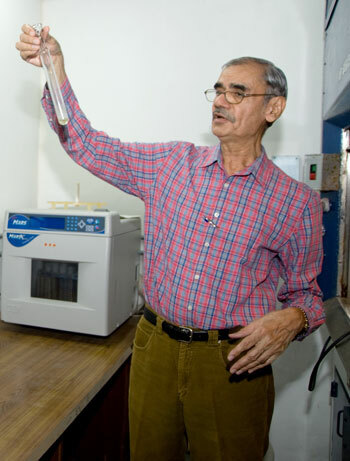 Dr Sahrawat, born on 7 November 1941 served ICRISAT as a Soil Chemist from February 1978 to December 1991 in the Resource Management Program. He them moved to Côte d’Ivoire as Principal Soil Scientist at West Africa Rice Development Association (WARDA) from April 1991 to June 2001 in the Rainfed Program. Dr Sahrawat returned to ICRISAT-India as a Consultant/Visiting Scientist from May 2002 to February 2016. As a soil chemist, he played an important role in standardizing and comparing different methods of analysis by using conventional and state of the art technologies. As a scientist, his role was to conduct research in the areas of soil chemistry and fertility of the semi-arid tropic soils with emphasis on the role of sulfur and micronutrients on crop production under dryland agriculture. He also played a pivotal role in preparing the soil fertility atlas to help showcase various types of soils and their deficiencies. Also, his role as mentor and guide for several short term interns, PhD students and MSc students makes him a role model for many in the field of research. Dr Sahrawat’s scientific achievements were also reflected in the many awards and honorary positions he received. In 1974 he was awarded the Seth Lachhi Ram Chudiwala medal by the Indian Agricultural Research Institute, New Delhi. He has held the position of an Adviser for the International Foundation of Science, Stockholm, Sweden from the year 1998-till present. He also played a pivotal role as a Member of the Watershed team, which was honored with the Doreen Mashler Award in the year 2006 by ICRISAT, Patancheru and the Resource Mobilizer Award in the year 2006 for outstanding efforts in mobilizing resources in Asia. In 2008 he received the Millennium Science Award as a coauthor for the Scientific Article entitled “Carbon sequestration in the semi-arid tropics for improving livelihoods’ published in the International Journal of Environmental Studies, 2007. Being an avid writer, Dr Sahrawat has contributed to 186 refereed journal articles and authored more than 100 publications, book chapters, research bulletins and workshop proceedings. Dr Sahrawat was a warm, gentle, honest, and hard-working human being who was considered a friend to many and a mentor to all who had the good fortune of knowing him. The ICRISAT family conveys our sincere condolences to his family members who are in our thoughts and prayers at this time of grief, loss and mourning. 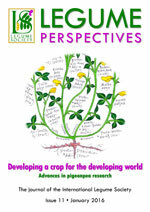 This issue is devoted to pigeonpea, an important legume crop for arid and semi-arid regions of the world. This issue covered general aspects of the crop, such as origin, genomic resources, major abiotic and biotic constraints, etc. 16 - 18 November 2015, Brisbane Convention & Exhibition Centre, Australia. Abstract: In semi-arid Zimbabwe, multiple constraints impact maize-based crop-livestock systems creating a poverty trap. In this paper we demonstrate co-designing approaches (i.e. with multiple stakeholders) for two sites i.e. Gwanda and Nkayi districts, of contrasting agro-ecological potential. We engaged low, medium and high resource endowed farmers and at both sites incremental change options improved food security through better-integrated cereal-legume-livestock systems; income effects were however limited. Recommendations that take into account socioeconomic context and policies are key and need to be communicated effectively for enabling more sustainable futures for smallholders in Zimbabwe. Technology frontiers for soil management. Abstract: It is projected that by 2030 India will require a minimum of 304 million tons CMt) of foodgrains, 175 Mt of vegetables, 96 Mt of fruits, 170 Mt of milk and 21 Mt of meat, eggs and fish. The need of the hour is to (i) refine the existing technologies to meet the needs to contemporary agricultural systems, (ii) cope with the weather aberrations and (iii) meet the demands of diversified food preferences of the Indian population. Some technologies are discussed here, which have the potential to improve the soil health, protect natural resources such as land and water, safe-guard environment, besides offering mechanisms to cope with the weather aberrations and extreme events. Mapping late leaf spot and rust resistance using an improved consensus map in peanut (Arachis hypogaea L.). Published: 2015. In: Proceedings of the 8th International Conference of the Peanut Research Community-Advances in Arachis through Genomics and Biotechnology (AAGB-2015), November 4 - 7, 2015, Brisbane, Australia. Abstract: Late leaf spot and rust are the major biotic stresses in peanut worldwide. An effort was made to map late leaf spot and rust resistance using the recombinant inbred line populations derived from TAG 24 x GPBD 4 and TG 26 x GPBD 4 in peanut. The new genetic maps were developed by mapping a large number of Arachis hypogaea transposable element (AhTE) markers in addition to the previously mapped SSR markers. A consensus map was generated based on these two independent maps, which was employed for detecting the genomic regions governing late leaf spot and rust resistance measured at three stages (70, 80 and 90 days after sowing) in 12 seasons. Details of the quantitative trait loci identified from this study will be discussed so as to use them in molecular breeding of peanut for improving late leaf spot and rust resistance. Evaluation of multiple stress tolerant groundnut genotypes for productivity and nutritional quality in Nigeria. Abstract: Evaluation of 541 advanced breeding lines of groundnut along with local landraces and improved varieties for their reaction to drought, rosette and foliar diseases besides productivity parameters over two locations during 2014 main season resulted in identification of 45 promising lines with significantly superior pod yield (1304-2796 kg/ha) compared to check entries (189-1005 kg/ha). Further, these superior genotypes were evaluated for nutritional quality in trials during 2014-15 dry season to confirm their superiority. Nutritional quality (oil, OIL ratio, protein, Fe and Zn content) analyses lead to identification of nutritionally dense genotypes that will serve as ideal genetic resources to develop agronomically superior and nutritionally enhanced groundnut cultivars with multiple resistances to biotic and abiotic stresses. Abstract: Haulms from four groundnut cultivars (ICGV 02266, 86564, 91114, and 00440) were compared with Co4 grass (+100 g concentrate) fresh and as silage (+200 g concentrate measuring voluntary feed intake, digestibility and growth over 43 days in 6 groups of Nellore rams with six animals per group (28.37+kg). Organic matter intake and average daily weight changes were significantly (P<0.05) higher in rams fed on pure groundnut haulms compared to those on either supplemented Co4 fresh grass or silage. Published: 2015. Tropical Agriculture Conference 2015: Meeting the Productivity Challenge in the Tropics, November 16 - 18, 2015, Brisbane Convention & Exhibition Centre, Australia. Abstract: The global problem of food security is particularly acute in many parts of west Africa, where food production needs to increase to meet growing demand. 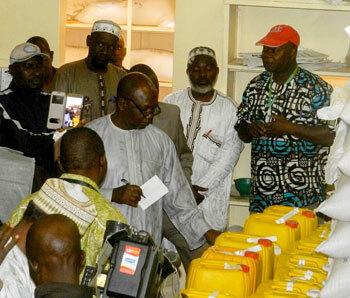 However, in much of west Africa farmers have not adopted improved crop varieties. One major roadblock to adoption of improved varieties identified in Savelugu, northern Ghana, was a lack of sufficient improved cowpea seed (an important cash crop). In northern Ghana there are very few certified seed producers, mainly due to the highly regulated certification process. More than 90% of seed is traded between farmers in an ‘informal’ seed market. In trials conducted in the Savelugu region improved, certified, cowpea varieties consistently outperformed farmer varieties and at field days farmers showed a strong preference for improved varieties.In the Savelugu region we worked with an Innovation Platform on a pilot system where one seed producer contracted ‘out-growers’ to produce certified seed, while the seed producer performed the certification processes and provide the required inputs and technical support. These out-growers were situated in villages around Savelugu, where they were able to use the informal supply chain to deliver 20 additional tonnes of certified seed to farmers in the first year of operation. Screening of groundnut interspecific derivatives for resistance to Sclerotium rolfsii. Abstract: Sclerotium rolfsii is a major constraint for production in most of the groundnut growing areas in India inflicting 28-30% yield losses annually. Irrigated groundnut grown in post-rainy and summer seasons in India is often infected by this pathogen. The 54 interspecific derivatives and 6 recombinant inbred lines (TAG-24 x R-9227 cross) along with 6 check varieties CDh-86, Dh-216, ICGV 91114, Dh-3-30, R-9227 and TAG-24) were screened for S. rolfsii resistance in sick plots during summer and Kharif 2012. In summer, 28 lines and 32 lines in Kharif showed highly resistant reaction to stem rot disease. High genetic variability and heritability was observed for disease and yield attributes viz., number of pods per plant, pod yield, harvest index, disease incidence at harvest, disease severity and disease spread irrespective of seasons. Per cent disease incidence at harvest was having strong significant negative association with dry pod yield per plant in both seasons. The interspecific derivatives viz., ICGV 3649-1, ICGV 4368-1, ICGV 3727-4, ICGV 34-1 and ICGV 4670-7 and recombinant inbred lines viz., RIL 3-14, RIL 6-1 and RIL 6-28 had desirable combination of high level of stem rot resistance and good agronomic attributes. These promising lines can been tested in trials over locations to confirm their superiority and utilized in breeding for Sclerotium disease resistance. Published: 2015. In: 47th Annual Meeting of the American Peanut Research and Education Society (APRES), July 14-16, 2015, Francis Marion Hotel, Charleston, SC, USA. Abstract: Iron deficiency chlorosis (IDC) is of common occurrence in groundnut growing areas with calcareous, alkaline and black soils which accounts to one-third of the Indian soils. Groundnut is sensitive to iron deficiency, but shows genotypic differences for iron absorption efficiency (IAE) response. A pot experiment was conducted using five genotypes with varying degree of IAE [ICGV 86031 , A30b (efficient), TG 26 (moderately effiCient), TAG 24, TMV 2 (inefficient)] in normal and deficit Fe soil types to determine underlying mechanisms. They were assessed for IAE related traits like visual chlorotic rating (VCR), SPAD chlorophyll meter reading (SCMR), chlorophyll (a, b and total) content, active iron (Fe2+) content and peroxidase activity in initial expanded leaves across five crop growth stages (20, 40, 60, 60, 100 days) and also for productivity traits. Iron absorption efficient groundnut genotypes recorded significantly lower VCR, higher SCMR, higher active iron, chlorophyll (a, b and total) and peroxidase activity across all five crop growth stages compared to inefficient genotypes. Severity of chlorosis was highest at 60 days during which significant negative correlation was observed between VCR and IAE related traits like SCMR, chlorophyll (a, band total) content, active iron content, and peroxidase activity indicating their utility as surrogate traits In screening for IAE in groundnut. IAE related traits showed significant positive association with productivity traits like pod yield, 100 seed weight, number of pods and primary branches. Pod yield reduction due to iron chlorosis in efficlent genotypes was very less compared to inefficient genotypes. Indeed it has been most outstanding success of Kenyan farmers growing groundnut and recieving double price of their produce. In India also the scientist developed a bold seeded variety with great export potential long time back. However, it is due to poor tie up of farmers with the market that they are not able to get higher profit. I consider it a very significant contribution of ICRISAT to Kenyan agriculture. Congratulations!